The Amperis Products a complete line of Aerial Lift Test Sets. 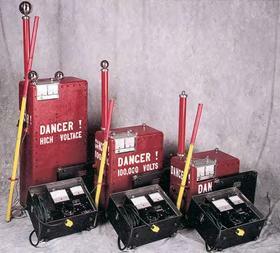 The model C50 is the most popular unit for distribution class trucks (Category C and Category A&B to 69kV). Its 100kV output allows for testing of all Category C trucks and the largest bucket liners. The use of DC allows testing of even the largest bucket liners without purchasing extra-large and heavy testers required of AC testers. All Amperis testers are RATED FOR CONTINUOUS DUTY at full power, allowing continuous operation without concern for damaging the tester, unlike many competitive units. The model C-170 provides for testing of category A&B trucks up to the 138kV class. C series topping units can be used to extended testing up to cover even 500kV trucks. DC testing of Aerial Lift provides several distinct advantages over AC testing. While leakage currents are similar for both methods, AC units have to provide for capacitive coupling currents that greatly affect the readings. These capacitive coupling currents can mask a dirty or defective boom that would be detected by DC. These currents also require AC units to have very high output ratings (5kVA-15kVA) as opposed to DC units, which are typically 500W, or less. Less than 1% in normal use. Units terminated with 1 megohm 100kV protective output resistor and corona suppression balls. Overall length of 39” (99cm) consisting of two insulating sections, one 7.5 megohm resistive section, one hook, one insulating shield, and one ground connecting strap. Unit collapses to store inside control box. Overall length of 65” 165cm) consisting of three insulating sections, two 7.5 megohm resistive section, one hook, one insulating shield, and one ground connecting strap. Unit collapses to store inside control box. A kilovoltmeter multiplier resistor connected directly to the high voltage guard circuit. This gives direct voltage measurement of the high voltage output. A magnetically and electrostatically shielded and guarded output meter assembly in the HIGH VOLTAGE LEAD with ranges of 0-100 microamp and 0-1 milliamp. Each meter is individually protected by a special bypass circuit. Range changing is accomplished automatically. Special ranges can be furnished. This assembly is replaced by a multirange 0-10 microammeter in the control box in the Model CG. The overlapping ranges are 0-10/30/100/300/1,000/3,000/10,000/30,000 microamps. A cold guard (non-measured) connection when current metering is provided in the ground return lead. (Model CG and units with option D). 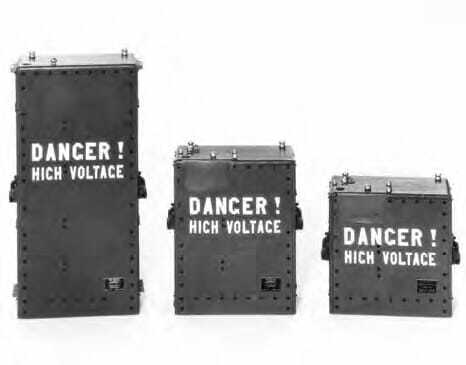 A variable autotransformer for adjusting the output voltage from zero to maximum rated test set voltage. 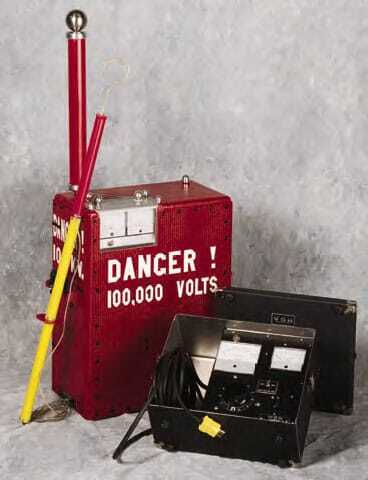 A ground relay circuit so arranged that the high voltage cabinet must be grounded in order to operate the unit. A linear rectifier-type primary 0-5 A.C. ammeter permits extrapolation of the D.C. output current from 1 milliamp to 5 milliamps. This is omitted in the Model CG and units with option D with output current metering in both the high voltage output lead and the ground return. 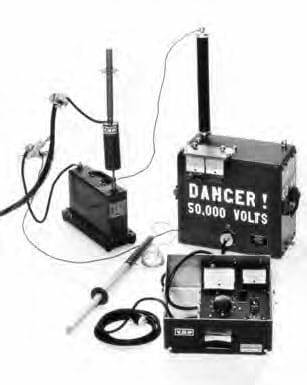 A 50 microampere special high torque kilovoltmeter with its calibrating circuits. Each unit has two ranges. They are 0-15/50kv or 0-15/60kv or 0-30/100kv or 0-30/120kv or 0-60/170kv. Additional 0-5/10kv ranges (50kv to 120kv units) and 0-10/20kv ranges (170kv units) are available as option A. A four or six conductor cord for connecting from the control box to the high voltage cabinet. A storage compartment 5” (12.7cm) x 5-1/2” (14.0cm) x 12” (30.5cm) to hold the connecting cords and sectionalized discharge stick. Varistors across the incoming line to the case ground constitute an alternate safety ground and provide surge protection to the test equipment. A three wire cord with three wire grounding male cap plug. 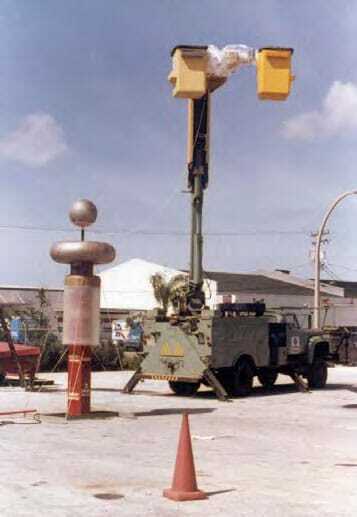 A cold guard selector switch with metered isolated return and metered ground return positions is furnished on the Model CG units and units with option D.
Units rated 50kv, 60kv, 100kv and 120kv have a stick with an overall length of 39” (99cm) and consist of two insulating sections, one resistive section (4 megohm for 50kv & 60kv, 7.5 megohm for 100kv & 120kv units), one hook, one insulating shield, and one ground connecting strap. Units rated 170kv have a stick with an overall length of 65” (165cm) and consist of three insulating sections, two resistive sections-7.5 megohms, one hook, one insulating shield, and one ground connecting strap.